Select items from the drop-down boxes below to learn more about adopting rabbits, cats, rats, and guinea pigs from shelters and rescue organizations throughout Southern California! Rabbits make wonderful indoor companions! They can be litterbox trained, can coexist happily with non-aggressive cats & dogs, and can live 10 years or longer. As indoor companion animals, they provide affection and lots of laughs with their silly antics and curious nature. They are more social, healthier, and happier when they are spayed or neutered. They also thrive best with daily exercise, affection and companionship. 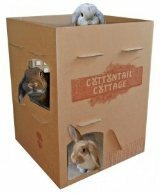 There are many rabbits (and other small critters) throughout Southern California looking for loving homes.